Your crochet hook will determine the size of your stitches, even when using plastic bags. The art of plastic bags crochet gives the phrase "reduce, reuse and recycle" a whole new meaning. What is Plastic Bags Crochet? Plastic bags crochet is a technique used to make a variety of items by crocheting together strips or loops of plastic grocery or similar bags. This style of crocheting has been around for decades, but with an increased awareness in recycling, more crafters are coming up with designs and patterns for everyday household items using these bags. At least two to three dozen plastic grocery or similar bags in different colors and strengths. A variety of crocheting hooks. An idea of what kinds and sizes are available can be found at Sizes.com. Be sure to check your pattern before you begin to determine what size you will need. Typically, you would need a J hook or smaller. For starters, make sure the bags are clean and dry. Do not use bags that contained raw meat or fish or dairy products that may have leaked. Also, avoid bags that carried any type of chemical. If a bag smells bad, you can try washing it with soap and warm water. If the bag still has an unpleasant odor, stick the bag in your recycle bin and try another. Preparing your bags depend on which method of crocheting you are planning to use. With sharp scissors, cut the handles off your bags. Starting at the top of the bag, cut across the bag horizontally. Each cut should be about two to three inches wide. This will form the loops. Fold the loops lengthwise to make the plastic stronger for crocheting. Join the loops together by putting one inside and inserting both ends into one another until knots form at the end of each loop. Continue to do this until you get your desired length. Cut the handles off the plastic bags. Starting at the top, cut the bag at an angle and keep cutting until you get one long continuous plastic "yarn" strand. If you are using thinner grocery bags, make the strips about two to three inches wide so they can be folded over to create a stronger plastic strand. 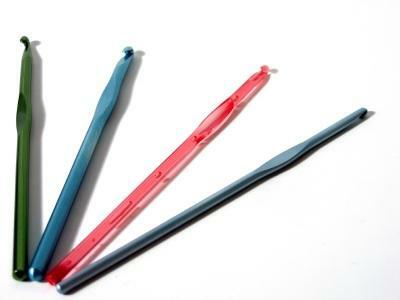 Roll your plastic loops or strands into a ball, like you would knitting yarn or crochet thread. To add color to your project, alternate between white plastic bags and colored recycling, garbage or bread bags. Now you are ready to go. Bag keeper: At My Recycled Bags, create this great plastic bag keeper made from and for recycled bags. Rug: A plastic bag rug pattern is available at Thrifty Fun. Besides instructions, there are also step-by-step photos showing the project in progress. Necklace: Yes, you can even make a crochet necklace with directions from Makezine.com. Purse: At Craft Bits, make one of these pretty recycled plastic bag purses. Using the plastic bags crochet method is a great way to create something from literally nothing. If you have children, it is also a great example of recycling every day items into other everyday items. Have fun!